Hello. Can anyone confirm what this is? Tea strainer? Also, is marked 84 , tomwn of Kostroma, can anyone identify makers mark(Looks like“ BBIL”)? Thanks. 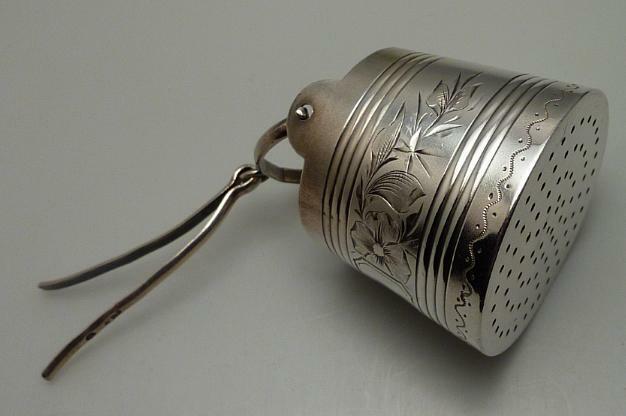 Yes, it is a Russian tea strainer in 875/1000 silver (84). Unfortunately the "hook" to put into the tea pot's spout is missing. Anyway, the strainer is made in Kostroma 1882-1898. The maker is unknown to name. Right, a tea strainer assayed in Kostroma 1880 - 1890. There is no maker ВВШ in PL book. Qrt.S gave exact years; mine were approximate 1880 s to 1890 s.
The hallmark tells the exact years. The notches indicate 1882 and in 1898/1899 the left looking kokshnik was implemented and this hallmark abolished. The maker is Vasiliy Vasilievich Shorokhov (Василий Васильевич Шорохов) from Podolskoe village, Krasnoselskaya volost, Kostromskaya gubernia.